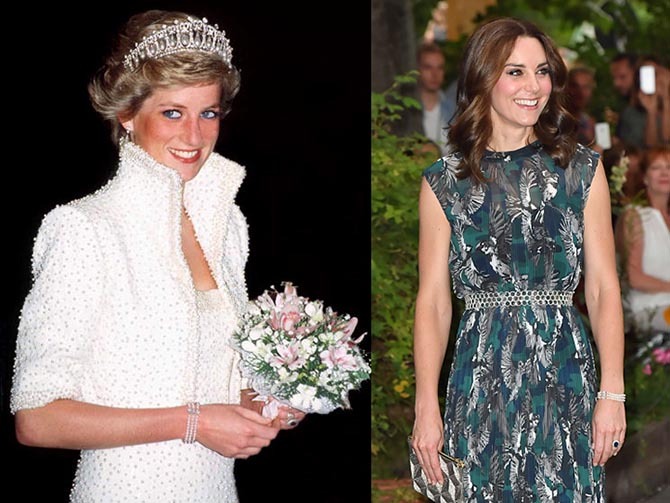 In 2017, the Duchess of Cambridge, Kate Middleton, was photographed wearing a three strand pearl bracelet that had a strikingly eerie resemblance to the one worn by Princess Diana. Once these photographs surfaced, while the royalty was touring Poland and Germany, it was the bracelet that got everyone talking. Nigel Milne, the designer of the three strand pearl bracelet later confirmed that the piece indeed was the one that belonged to Princess Diana. Everyone knows that the Duchess of Cambridge is a lover of hand-me-down jewelries and this piece was no different. This post will show you some of our top pearl bracelets and will give you some useful tips as well. Time is a witness to the fact that the pearl bracelet is a sign of elegance, class, and grace. They have traditionally been worn at ceremonial occasions like weddings but slowly, they have started to make an appearance at boardrooms, parties, and other events too. They have been the precious stones that never fall out of style. So what makes the pearl bracelet so enticing even after the switch from generation to generation? And how can one wear such a timeless beauty irrespective of the era you live in? We know you’re bubbling with questions, so let’s find out! Wearing pearls started from the Greek civilisation, or at least the documentation of the gem stone took place then. The gemstone touched new heights in 16th century England, which later came to be known as the Pearl Age. Interestingly, until the 1900s, pearls were associated with royalties and only after the period when the Asians discovered how to culture pearls, did these little treasures open up to the masses of the entire world. Most jewellery items are work on the face or the neck, unlike those, the pearl bracelet is worn on the wrist. Thus, they are relatively easier to spot and admire as compared to the more intimate jewellery pieces. However, just because they are worn on the arm does not, in any way, mean that they are disconnected from the entire ensemble. In fact, despite being the general distance from the rest of the outfit, bracelets can complement the other portions of the body, including the clothes and the other jewellery pieces. Pearl bracelets offer a kind of balance to the otherwise crowded neck, face, or upper body. It takes the focus off the general portions of the body and shifts it to the otherwise ignored sections, like the arms and the wrists. 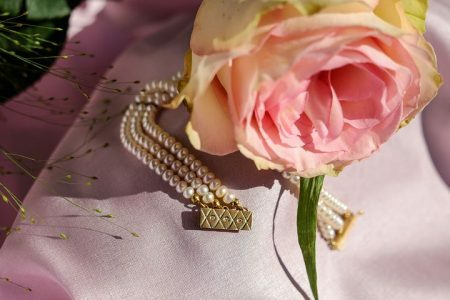 Interestingly, when the wearer of the pearl bracelet extends their arms or hands as a sign of greeting, the simple gesture is transformed to an aristocratic one simply because of the presence of the pearl bracelet. Whether it is at a meeting, an evening date, party, or a wedding, anybody who receives such a greeting will experience pure joy. So, if you are looking for a jewelry piece that will help you make a lasting first impression, a three strand pearl bracelet is the way to go. Pearl jewelry is passed down from generation to generation and the same goes for bracelets too. Pearl bracelets symbolise purity, chastity, and modesty in the wearer. It adds an aura of charm and dignity to the wearer. The following are the main types of pearl bracelets. The next section will also cover how to wear them. A delicate single strand of pearl coiling delicately along the wrist is a fitting finishing touch to any and every outfit. The single strand of pearl can be suitable for nearly every event or setting. The single strand pearl bracelet never goes out of style whether you are wearing it at your work setting or at a casual outing. A single strand of pearl can make the wearer feel a little underdone. While it suits most occasions when you wish to be minimalistic with your jewellery, it can be a little underwhelming for some. Therefore, a double strand pearl bracelet can be a bolder option when compared to the single strand pearl bracelet. When you are pairing your pearl bracelet with a casual outfit, you need to wear something that makes a fashion statement: the three strand pearl bracelet. A statement jewelry is a necessity in the case of casual outfits when you can afford to wear more loud and obvious pieces. The triple strand pearl bracelet is ideal for such a casual setting. Therefore, here are 3 of our most stunning triple strand pearl bracelets from our collection. Not everybody can pull off a black bracelet, but this black pearl bracelet with triple strands is truly magnificent. The sumptuous color of the black pearls will give you a fashionable appearance. If black is your happy color, then you will be delighted to wear such a piece. This bracelet carries a dose of enchanting mystery and elegance. All in all, the triple layer of genuine dyed black freshwater pearls will last for years and will help you create special memories. This three strand pearl bracelet with 6-7mm white cultured pearls is one of the timeless pieces of jewelry that you can pass on from generation to generation. Without any cheesy words, this accessory is a wonderful legacy. It is the kind of gift that never disappoints. This bracelet with triple strands will add a touch of class and elegance to any outfit. The white pearl bracelet is neither boastful nor loud. Pair it with the triple strand necklace and you will get the complete look of a true refined lady. Now here is an exquisite mix of Tahitian pearls with delicate freshwater pearls. The small size white pearls combined with the larger black pearls make this triple strand pearl bracelet a real statement piece. Obvious, but not opulent, sophisticated, but not extravagant, this pearl bracelet will bring you a lot of compliments. Just wear you favorite red or black dress, a pair of stilettos, red lipstick and there you have it: a truly glamorous look with minimum effort! The overall AA out of rounds shape is not easily noticed on this unique bracelet with the AAA luster coming into play and spraying a level of spraying glow throughout the pearls and bringing up the shimmering and shine factor as a whole. Small and petite women with a delicate frame should opt for pearl bracelets made out of delicate Japanese Akoya pearls. When it comes to wearing pearl bracelets, ensure that the style of the jewellery complements the style of your outfit and clothing. Even though some vintage pearl bracelets may look amazing with your jeans and blouse, wearing something more contemporary will actually tie down your entire look. Two-toned pearl bracelets are fairly popular and are good to experiment with. You can use two contrasting colours, like white pearls with black pearls, or you may settle for white with gold. In the end, it all boils down to your personal preferences and style. If you are layering your pearl bracelets and are using light and dark pearl combinations, use the darkest pearl towards the wrist followed by the lighter shades. Arranging the darker shade in the middle will make the jewellery item less effective. Try and wear pearl bracelets that are in contrast with your clothes. Even though paler pearls look good against lighter clothes, some dark pearls may not look appealing with dark clothes. To avoid overdressing, you can coordinate your pearl bracelet in accordance to your pearl bracelet. If you decide to wear a neck piece as the highlight of your dress, try to avoid any dilution by putting on some pearl bracelets. However, if you are wearing a plain single pearl on a chain, then you can put on layers of pearl bracelets to go with it. You may layer your pearl bracelets with other fashion accessories like bangles and watches. Keep the colour scheme in mind, if you are looking for a white-gold theme, you can use gold bangles to go with your white pearl bracelets. In fact, you can even pick out a pearl cuff that contains a hint of metal along with your favourite gem stone – pearls. Speaking of layers, pearl bracelets with charms are the newest fashion trends and you can also use them for daily wear. They go well in almost every possible setting from casual to formal. Eventually, everything is about your personal style. You can refer to many styles and try them out individually or as a mix of these. Find a style that appeases your personal style and stick to it. Do not copy anybody else’s style because something different may suit your personality. If you plan on gifting a pearl bracelet to your near and dear ones, you can use their old bracelet or bangle for a measure of their wrist. Also keep in mind whether the wearer likes to wear their bracelet loosely or in a tight fit. If you don’t know exactly what size pick, you can simply opt for a ‘one-size-fits-all’ jewelry piece. Check out our entire range of stunning pearl bracelets and make your pick to which piece will sweep them off their feet! Celebrities are setting off pearl trends and giving us pearl jewellery goals. Check out some popular celebrity styles, which show off their on point pearl bracelet looks. Seen here is Sharon Osbourne in pearl bracelets on either hands. On her right hand you can see the turquoise triple strand pearl bracelet that pairs up beautifully with her ring and earrings. A smaller pearl bracelet of the same shade completes the look. 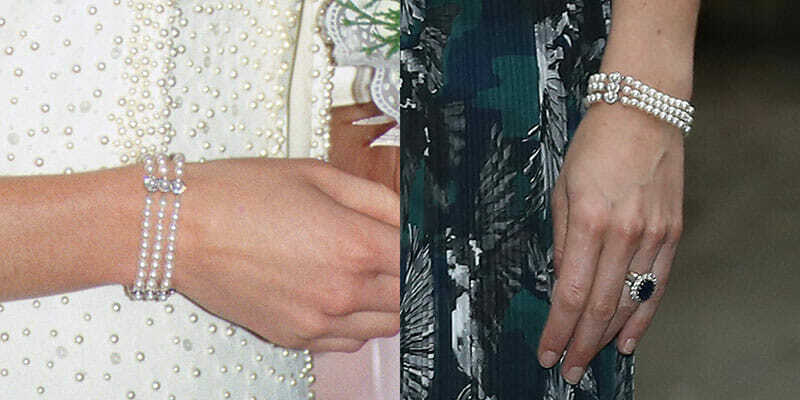 On the other hand, you can notice the two layers of accented white pearl bracelets. Notice how the Mexican-American beauty balances the shimmer of the diamonds with the soothing appearance of the pearls? Furthermore, the various accents of the 5 differently coloured pearls is a detail you just cannot miss. The gorgeous cuff paired with the pearl and diamond earrings gives simple yet elegant feel to the entire appearance. Salma Hayek makes a wise decision by ditching any neck pieces, which makes the cuff the centre of everyone’s attention. So, from featuring in the recent adaptation of the 1920s novel, Great Gatsby, to Duchess of Cambridge Kate Middleton’s wrist, to adorning many bold and beautiful red carpet looks, the three strand pearl bracelet, and not only, continue to woo the pearl enthusiasts even after decades. The popularity of the pearl bracelets even to date indicates that pearl accessories are here to stay, making it yet another pearl jewelry item that enters the hall of fame for classic jewelry pieces.